This was Penicuik’s first game since 12th December and it was a must win scenario for the club as they were sitting in second bottom spot in the league having played two games more than the other clubs in the league. The game kicked off in cold, wet misty conditions, but it took only ten minutes for the game to burst into life when Penicuik keeper Bald had to look lively to turn a Lynch attempt on goal round the post for a corner. From the corner, Feeney headed a foot wide of the upright. Two minutes later, Kelly attacked down the right for Penicuik, but his cut back was just blocked by an outstretched foot and cleared. In the 18th minute, Montgomery’s pace got him past his marker, but his probing cross was missed by everyone and cleared. 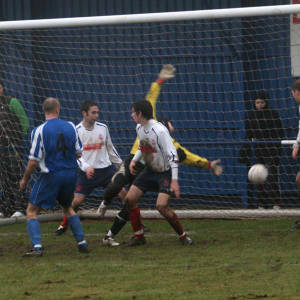 Then Armadale’s Lee Johnstone saw his long-range effort curl past the post. Immediately afterwards, Gay beat his man only to see his cross desperately booted clear in the six-yard box. On the half hour, Mauchline had a chance, but mishit his shot and Bald gathered easily. At the other end, bar should have done better when set up by Gay, but blasted the ball high over the bar. In the 41st minute, Armadale had the best chance of the match when Lynch crossed the ball into the box where Feeney was ready to volley home, but teammate Lee Johnstone stuck out a boot to deflect the ball away to safety. Right on half time, a long clearance by Whartley picked out Lee Johnston who shook off Meikle only to see his powerful strike brilliantly saved by Bald. In the 51st minute, following a throw in to Armadale, danger man LEE JOHNSTONE shot for goal from 25 yards and a slight deflection took the ball past Bald into the bottom corner of the net. In the 55th minute a neat move up the right wing by Penicuik saw Gay send over a searching cross into the box, but the attacking Penicuik players just failed to get on to the end of the cross. Armadale doubled their lead in the 59th minute when a free kick to the back post was headed back across goal by Ryan Johnstone allowing FEENEY to head home from close range. Four minutes later Penicuik had a great opportunity to get a goal back when substitute Walker set up Montgomery, but his strike went inches past the post. Penicuik were having their best spell in the game, and in the 69th minute, MEIKLE rose above the Armadale defence to head home from a corner kick. Then a great run and cross by Gay was headed straight into the arms of keeper Whartley. Immediately afterwards Gay again broke up the right and Buchanan’s diving header cleared the danger for a corner kick. From the corner, the ball was headed back across goal but Harvey was unable to get his boot to the ball. One minute later, Whartley rushed from goal to the corner flag, but his clearance was picked up by Barr in midfield. With Whartley struggling to get back in goal, Barr saw his long range lob go inches past the unguarded goal. In the 82nd minute, Armadale were awarded a soft penalty when a long clearance caught out Penicuik and Meikle was adjudged to have fouled Feeney as he burst into the box. FEENEY converted the penalty with ease. In Armadale’s next attack, a diagonal ball to the back post was slotted home by Lee Johnstone, but ruled offside by referee Hanlon. This went down badly with Johnstone and he vented his feelings on the referee who promptly awarded Johnstone his second yellow of the day. 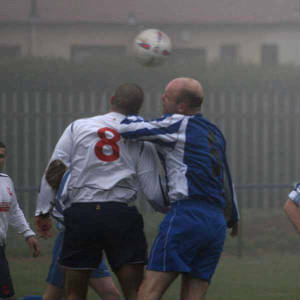 Penicuik competed well, but Armadale always looked more threatening in the last third of the park. This result puts Penicuik deep in relegation trouble and will add more pressure on them to win their remaining eight league fixtures.